Tommy was in the inaugural class of Career and Technical Education students from Milwaukee Public Schools who attended classroom training in Skills for Life and Work and Goodwill’s Culinary Institute Program. This new partnership between Goodwill Workforce Development, Goodwill TalentBridge and Milwaukee Public Schools was created to bring awareness of training programs and opportunities students can access. 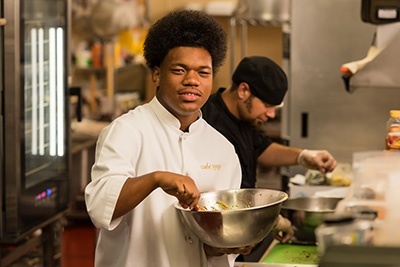 After hearing about the options available, Tommy applied for and participated in Goodwill’s Culinary Training sessions at Goodwill’s Café 1919. While in training, Tommy gained valuable work experience, as well as his ServSafe Certification. Not only did Tommy graduate from Goodwill’s Culinary Institute Training Program, he also graduated from Vincent High School in 2016.